Our late May and June journey into Germany and France will be remembered as "The Strawberry Road" as we ate pounds of strawberries during that interval. Our strawberry binge actually began during our jet lag recovery time in Rome where they were cheap, beautiful, and readily available. Strawberry season was underway when we returned to Germany and we continued striving for a daily dose of the red gems. Our consumption plummeted due to lack of availability of choice specimens the days we spent in France, but we made up for the shortages each of the many times we crossed back into Germany. Squeezing-in our impromptu, yellow-striped berry bag. But a more immediate solution popped up, which was hanging a vinyl bag that came with our last purchase of sunscreen from my aero bars. 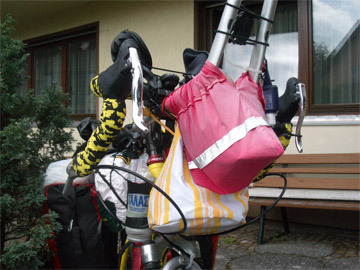 The seemingly useless bag perfectly tucked in between my front fender and the back of my red handlebar bag, giving us an instant, suspended berry bag. All good things come to an end, and we were only back in Germany with the new berry bag in place a few days when we were informed that the season was over. We carefully inspected roadside strawberry plants and indeed, there wasn't a speck of red fruit on any of them. Lucky for us, this was also a cherry growing region, so we didn't miss a beat as we transferred our devotion to them. The just-picked cherries were wonderful, but I still longed to continue our luscious strawberry streak. This was the first year that we'd been in a berry region during the season for more than a day or two. We'd always missed most of the harvest in the past and this was a heavenly indulgence. And the same was true for the cherries, as we weren't usually this far north in mid-June. Going to New Zealand this winter and consequently starting our European touring season later made for this happy coincidence. Learning to spot lime trees by their scent was also a bonus of being in the region at a different time of the year. We've seen thousands of the popular street trees, but never at the peak of their blooming season. Theirs is often a subtle scent, one that takes a cluster of trees to be noticed by untrained noses like ours. We were also treated to seeing our first Indian Bean Trees in bloom. Enjoying these different aspects of the trees again reminded us of how much pleasure we'd had from delving into tree identification when we biked in Great Britain in 2004. There we could easily buy European tree identification books in English and we still keep the little guides handy. As we entered the first valleys of the Black Forest, the rushing sounds of the creeks brimming full from the previous nights' fierce thunderstorms brought to mind the harnessing of such water for centuries by the region's old water wheels. The pounding rhythm of a passing commuter train probably wasn't louder, but was at higher RPMs than the old, water-powered, knocking sawmills would have been. Log trucks speeding down the road reminded us that timber was funneled out of this region on log rafts for 600 years. And the small business sign for a metal worker triggered images of giant old bellows and a smithy's foundry hammer, both that would have been powered by water wheels. It was the visit the day before to the Vogtsbauernhof Open Air Museum that was already making our Black Forest visit so vivid. We almost bypassed the exhibit of traditional Black Forest homes as we have seen a number of such ethnographic sites before. But we resisted that urge and budgeted a 3 hour visit. It was a smaller collection of buildings and equipment than others we'd seen but there were unusually substantive descriptive bits in English that made it a gratifying detour and immediately enriched our stay in the area. Looking inside a charcoal kiln. The outdoor museum exhibits went a layer deeper than most of their competitors and rather than just looking at the objects of the past, we learned about the challenges and the rhythms of early life in the Black Forest. The Romans had built a road through the region from Strasbourg, France (our launching point) to the Danube in 74 ce but since then there was no record of habitation until the 7th century. Silver and iron ore mining began in the 10th century and glass production and timber export out of the area were underway by the 13th century. Farmers filtered into the region to feed the miners and they remained after the mining boom was over at the end of the 18th century. The exhibits of farm buildings however focused on the farmers rather than the other industries. Farmers were typically allowed to control an entire valley or belt, from the top of one ridge, to the bottom of the valley, and to the top of the next ridge. They also managed the expanse up and down the valley, from 50 to 300 acres, giving them a range of soil types, weather conditions, and natural resources. At first, the life of these farmer families sounded like a very isolated existence, with each farmstead generally supporting a dozen or more family members and hired hands. But then the little details came out, revealing more outside contact that might have been welcome. There were the local monks who dropped in to collect the "wax tax". A specified amount of the precious beeswax the farmer pressed from his few beehives had to be ponied-up for church candles. Making fruit schnapps for papa was a common farm side line which prompted roaming local officials to exact a distilling tax. Then there were building regulations that these isolated farm buildings had to comply with as early as the 16th century, specifying such things as the type of jointing allowed and foundation requirements. And the manorial lords or monks that owned the land both dictated inheritance rules and routinely pocketed fees and tithes for themselves. We were surprised too to learn that the more prosperous farms had craftsmen cottages as lodging for essential service providers. Bread oven construction was a specialized craft and never undertaken by the farmer himself. Building the farmer's mammoth home and water mill were also refined crafts contracted out to live-in specialists. Itinerant craftsmen stayed in these cottages or inside the main house as late as the middle of the 20th century, though these men of more recent times worked on smaller projects. Rather than constructing buildings, these later trades people repaired broken tools and objects, or made new ones out of materials provided by the farmer. The harsh winter conditions throughout the Black Forest favored an "under one roof design" where all of the living area for the people and livestock was in the same massive building from the 16th century on. Most of the square footage would be for the animals, feed, and equipment, with only a half dozen dark, cold rooms for the people. Many houses had 4 or 5 levels under a steep 45° angled, hipped roof covered with rye thatch. The steep roof shed the snow and it came close to the ground to provide a sheltered walkway around the building. Usually there was a gently sloped, drive-in entrance into the 4th storey barn area on the steeper back side. The kitchen would be inside the house and its fire (which lacked a chimney) provided the only source of heat. Typically 400-800 conifers would be felled to provide the timber to build such a house, with the specifics of the design adapted to the regional needs. 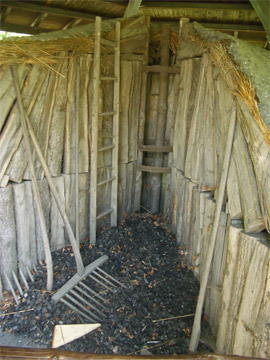 The compact storehouse of harvested grains, nuts, oils, bread, and extra cloth was a separate building--a building in line with the front door of the house as it was visited daily. 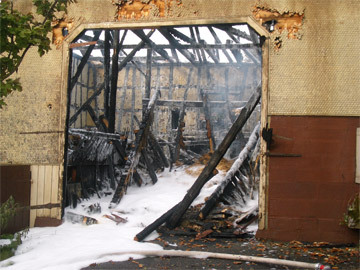 The stores were kept 50-80' away from the main building as an insurance policy in case of a house fire. The wooden storehouse walls were extra thick planks and its door had the sturdiest lock in the compound as theft was a problem. The bread oven and schnapps still were also built separate from the main house to reduce the risk of torching the homestead if their fires got out of hand. An original, Black Forest hemp press. What was most surprising however was to read over and over again that many of these monstrous but simple, dark homes were in use with little modernization until the 1960's, as were the ancient water wheel powered saws and flour and oilseed mills. One founder's hammer on the site wasn't retired until 1992, presumably still powered by water. Seasonal rhythms continue to dictate planting and harvesting in modern times as they did 500 years ago in the Black Forest, but most of their other old rhythms have been obliterated by technology. Sawing season was in the spring and fall when there were heavy rains to fill the rivers and power the waterwheel driven saws. Fruits were pressed for cider in the fall and seeds were pressed for oil in the winter. Because of the large amount of wood needed to preheat the oven, bread was only baked once a month in the oven that held 30 loaves. Spinning, straw hat making, and other crafts (including coo coo clocks later on) that provided some cash to the family were only undertaken in the winter months when all hands weren't needed outdoors. What was grown on each farm depended upon the quality of the soil and the elevation range of the farmstead, with few having good enough soil to grow wheat. At best, enough grain (usually rye) could be grown to meet the needs of the family and the lack of feed limited the number of animals to a half dozen to a dozen. Flax and hemp were raised for fibers needed for cloth and rope; flax, walnuts, poppy seeds, or rapeseed were grown to meet the oil needs. Oils were used for human consumption, lighting fuel, and lubricants. And it seemed that no matter how meager the existence, enough fruit of some sort was set aside for making schnapps, including blueberries that were the only suitable schnapps-crop at the higher elevations. And just like the crops and house design had to be carefully matched to the harsh conditions, a small and especially hardy breed of cow was raised that was dainty enough not to erode the delicate soils on the very steep slopes. A huge, exterior house wall painting celebrates log rafting. For most farmers, the forests provided more resources than farming, and trees were felled year round. 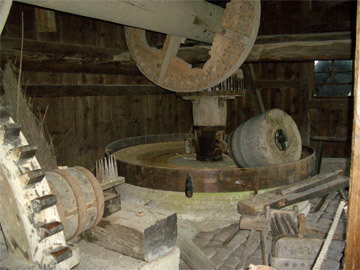 Some had their own water wheel-powered saw mills, with the early knocking saws requiring 45 minutes to cut a single plank from a log. The terribly steep slopes resulted in the evolution of waterless sluices on which logs sailed down at what must have been speeds of 40 mph. Giant log rafts were manned over small waterfalls to make their way to the Rhine River and eventually as far a field as The Netherlands. The Black Forest was substantially deforested between the 15th and 18th centuries as timber was cut for homes and industry. Two to three hundred acres per year of forest were cut to meet the charcoal needs of a single regional glass or iron works. 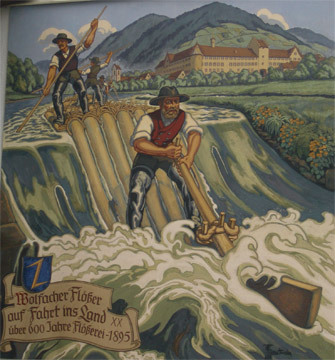 The well done outdoor museum of farm houses at Gutach introduced us to the Black Forest log rafting tradition and signs of it were everywhere as we rode the Kinzig River bike path deeper into the region. Each of the villages proudly claimed its part in the 600 year old industry that ended in the late 1890's. 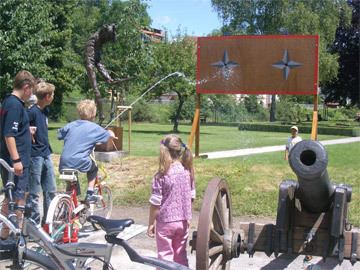 Models of log rafts, outdoor wall paintings on homes, and mini-museums were at hand to tell the story. Old water wheels still made their rhythmic pounding noises as the only moving parts in old saw mill exhibits and rafter's boots and the few tools of the trade were often displayed. Being alerted to this important regional heritage by our museum visit made it easier to spot the significance of the local presentations and caused our bikes to turn sharply to follow small signs in one overnight town that said in English "Raftsmen." Display boards in a park where we picnicked the previous day told of a reenactment of log rafting in the 1980's and it looked possible that there would a similar event soon. 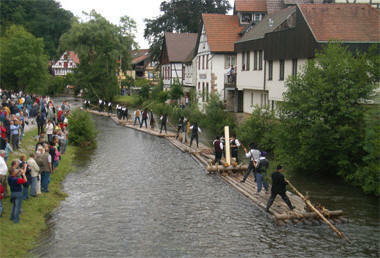 We soon learned that a brief log rafting demonstration would be held in 2 days. Navigating the logs through a calm stretch of the river. The "go on or stay" debate began, though was quickly settled when we learned that lodging in town was fully booked for the 2 nights sandwiching the event. We'd go on, but with difficulty Bill tracked down bus and train information in this lightly serviced area before we left. We hatched a plan to ride to our next destination and stay there an extra night, making a round trip back to the village by train to catch the 5pm event. It seemed reminiscent of viewing the Tour d' France where one spends an entire day or 2 to see something that lasts for about a minute. But we decided it was the proper thing to do: a once in a lifetime opportunity even though it wasn't all that grand of an event. But more obstacles arose as we learned that the bouts of heavy rainfall we'd been trying so hard to avoid riding in had raised the river level perilously high and the event might be cancelled. Another trip back to the event site yielded a phone number and Bill happily used his new cell phone to make daily calls keep tabs on the demonstration. Our Plan B rapidly looked almost as good as Plan A, which would have been staying in the event village. Our 2 night stay up the mountain gave us better accommodations for less money and we were just barely able to schedule budget-priced massages at our pension. It was mattering less and less if we'd laid over for an event that didn't happen. 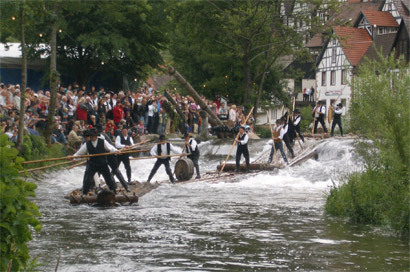 The crowd cheered as the men took the timber raft over the shallow falls. Yet another phone call was made to the man who always answered "Are you the couple on bikes?" The event was on. The hourly trains were on time and we only invested 20 minutes in travel time each way to see the modern raft in action. The threatening rain held off and Bill was just able to wiggle in to a couple of good photo-op positions to document our triumph. Like our more expensive train trip back to Trier for a special exhibition a couple of weeks ago, we were pleased with our intermediate solution for solving the "stay or go on" dilemma. And little did we know that the rafting event would punctuate the end of our Black Forest cultural experience. It took less than a day's riding to emerge from the Black Forest region and arrive on an enormous bulge in the Rhine River, which is lovingly known as Bodensee to the German's. We've been chided in year's past for slighting this famous recreational area that forms one of the borders between Germany and Switzerland, but now it was time to make our first visit. House fires weren't just a Black Forest worry. Our experience of Bodensee was reminiscent of other European tourist lakes. Between the often sweet and charming lakeside villages with their lovely, groomed parks and walking areas we were jangled by truck traffic. A common problem around these lakes is the traffic, with the 2 lane roads backing up with tourists in the high season and being hammered with truck traffic shooting by any day of the week. At least in Germany we were shielded by a dedicated bike path but it was too often side by side with the loud traffic causing us to pull off for "auditory rests." On Bodensee, like other German-Austrian region resort lakes before, we were struck by the number of differently-abled people on wheels. One young man whose apparent degenerative disease had practically reduced him to a puddle was able to electronically steer his wheel chair so that the skater pushing him kept up with the pack of other young men on skates. Our mouths were agape as we rode behind a 30-something woman who perhaps had cerebral palsy. The wild path her right leg traveled with each revolution made it a marvel that she'd ever managed to ride a bike. Once again, it was an amazing mix of individual determination, tireless support from others, and sometimes resourceful mechanics that were putting these folks on the road. The relatively flat lake areas that attract people for weeks-long holidays concentrates these road warriors like no where else that we ride. It's just amazing to see these "go for it" people intermingled with thousands of others effortlessly riding bikes. It was another holiday area however, the Dolomites, that would curtail our visit to Bodensee. The "not to be missed" Zeppelin museum mentioned in our guide book and other off-the-bike sites would have to wait for next time. We had apparently waited too long to initiate the process of renting an apartment in the Dolomites and so had to move our visit a week earlier to a less popular time. So, our already tight 2 week interval to reach the Alps had been cut in half. We'd had to both limit our visit to Bodensee to the sights seen from the saddle and likely take the train part way to make our July 7 booking. But given the stormy cloud cover had obscured the much-acclaimed view of the Alps across the Lake, a second visit wasn't a bad idea anyway. Photovoltaic, rather than solar water heating, panels were the rage. One of the unexpected delights in breezing through Bodensee was discovering that they manage to extend strawberry season to October, which meant we indulged ourselves again. The cherries had all but disappeared as we climbed up to the higher elevations of the Black Forest but dipping back down to the fertile valley floor at the Lake level of 1300' briefly put us in back in orchard and berry land. But our traverse of Bodesee only took a couple of days and then we were climbing up again, this time into the pre-Alps region called Allgäu. Sadly, that meant that the roadside signs suddenly switched from berry stands to ski lifts. Now, the regional products to be sampled weren't fresh produce but local cheeses. We love cheese, but it can't be eaten with abandon without consequences like the regional produce can. The Allgäu delivered beautiful scenery like all of the areas of our southern Germany route this year. The endlessly up-and-down terrain got steeper, but like the preceding days, was long on scenic beauty. Highly varied use of the land combined with the inherently uneven terrain provided the visual variety we crave. The types of prevailing crops and industry changed every couple of days and we were often near lakes or rivers, which kept it even more interesting. And all of these areas were crisscrossed by an extensive network of bike routes, some of them very heavily used, which made life easier for Map Man and added a sense of community to the experience. 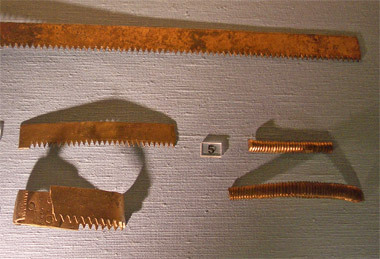 Pre-Roman copper saws & rasps found in the mountains. As often is the case, we cut through a segment of Austria on our way to the Dolomites. Austria gives us the same warm-fuzzies as Germany, with the people-scaled old town centers, many bike paths, and a comforting regard for outdoor activities. We've always enjoyed our time there in the past, though this year's biking won't be remembered fondly. Unlike prior years, Bill treated himself to a bike route book through part of Austria and we looked forward to a well crafted, historical route. The "Via Claudia Augusta" route celebrated the Roman and other history of the area, which was sometimes noted on the route itself and in our book. But it turned out to be a terrible route--15% grades on gravel with loaded bikes (in the rain) was not our idea of fun. It was the stuff of mountain biker day rides by my standards, yet they had wilder routes marked for them. After being appalled at what our trusted BikeLine bike book had done to us, Bill spent more time doing a careful translation of the German. Even the authors agreed that the segment we were on wasn't a bike route by their standards and they suggested taking the bus. "Bus? What bus?" With a little deeper searching, we discovered that there were established bus services to take cyclists and their gear past the gravel passes and beyond, if they chose. The next morning after learning this, we were in one of those mini-buses for a short hop on the main road which conveniently bypassed the next difficult graveled bike route summit. And the next day, we and our bikes accepted another lift on a city bus up a horrific hill so as to visit a pocket-sized museum. 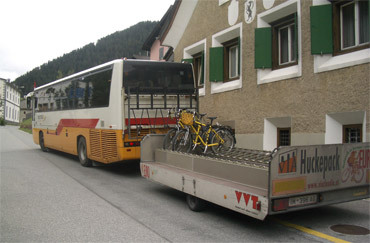 We rode down the hill and waited for yet another bus with a big trailer affair just for bikes (bikes ride for free). We were able to take it to the Italian border where we discovered that there was connecting service, so we hopped on again. "Huckepack" hauled us over the pass, skipping the gravel route. The last bus deposited us at a train station where we remembered that the ultra modern, 2-car commuter would take us all the way to Bolzano. We had intended to pedal part of this area, but the pricey ticket in our hands for bikes on public transport in Italy was good for the rest of the day, so we decided to claim the value on the ticket by continuing on. Suddenly our ride through part of western Austria was truncated to 3 days and we had only pedaled about 50 of the planned 90 miles. But much of the riding had been terrible and the remainder would also have been terrible. Additionally, we knew we'd have to take a train for part of this Austria-Italy leg to make our Dolomites apartment reservation, so this had unexpectedly been the perfect time to do it. But nonetheless, it was a surprise to end a day in Bolzano, Italy when we'd assumed we'd be in Austria a bit longer. Biking through southern Germany and then Austria once again had me pondering why I always look forward to traveling through these Germanic countries. The many bike paths are a treat as are the often postcard-perfect old town centers and hearty breads, but there is something more that I enjoy--which is the dynamic outdoor social culture. I love nothing more than being on a German bike path and encountering a wide spot in the route where there is a lively cluster of other riders, walkers, and skaters. The path and outdoor infrastructure seem crafted to create convergences--places were people will pause and mingle. I delight in the robust energy and bustle of people enjoying themselves outdoors. Few of these folks are out for an intense athlete event but instead are enjoying an outing that blends the exhilaration of being outdoors with the joy of being with friends and family. These extensive, well-signed paths with nicely maintained benches and picnic tables invite people to make frequent outings. Focal points of waterways, charming pedestrian/bike bridges with potted flowers, and occasional parks reward the effort. And I suspect that the German tourist etiquette that demands a "Good morning" greeting to all upon entering the breakfast room of a B&B or hotel carries over to these outdoor situations too as people are welcoming to all that pause. I've never had a great need for solitude in the outdoors, and these paths with their convergence zones certainly don't offer that to the weekend warrior. They are very different than the trail heads in the US where you park your car and your small party heads out on a wilderness trail as a solemn event. Instead, these German bike paths can become brief sidewalk parties when a group of late middle-aged, out of breathe riders stop for a rest. Sunday afternoon "enhanced" Gemütlichkeit for the kids. These fleeting outdoor communities are also much more generous feeling than the sidewalk cafe scene of Mediterranean countries or of trendy US neighborhoods. The sidewalk cafe culture is more passive and the interactions tend to be limited to the small party you are with and the staff. Unlike on the sport paths, the interpersonal dynamic doesn't ricochet around the space and it's just not done to strike up a conversation with those seated at other cafe tables. In contrast to other regions, we also appreciate the "linger for free" option in the Germanic countries were public benches are common. When we move out of the Germanic cultures, we are often hard pressed to find public space in which we can eat our picnic lunch. In France, we head for the "Marie" or city hall or scout out the church grounds for a place to light. Outside of the more Germanic northern reaches of Italy, we have struggled to find a place in Italy for lunch. We've resorted to curbs under highway overpasses to find shade that isn't blocked off with a fence. This lack of free public spaces to pause also means it cuts us off from co-mingling with others engaged in walking and biking--you're expected to sit at a cafe and pay for a beverage when you want to rest in these countries. It is this treasured Gemütlichkeit (coziness, good feelings) in the Germanic countries that is one of the things I love about our travels and why we always spend some time each year where we can experience it. There is nothing quite as nourishing back home, though I know the City of Portland has made a conscious effort to create people spaces, to encourage strolling and lingering. I know that some friends get their fix of Gemütlichkeit by going to music performances at neighborhood pubs, attending concerts and plays, or by participating in church or other membership organizations. The closest I ever came to getting my Gemütlichkeit in the States was during the daily bike trips I made to the downtown city core for a yoga class, as I loved lingering in the lively city energy. It had that combination of being outdoors and the convergence of people, though it was just a premonition of the more intense Gemütlichkeit I enjoy when we are on the road in Germany, Austria, and northern Italy. We're in Austria for the second time this season, though not on the Via Claudia Augusta bike route. We spent about a month in the Italian Dolomites and unlike previous years, more time was devoted to hiking than biking. So much time was spent hiking that we got woefully behind on the webpage and our studies and now we are scrambling to catch-up. We made an unexpected detour back into Austria to pick-up a new battery for our laptop--a little event that took about 2 weeks to arrange and 13 hours on trains for Bill to retrieve. Unfortunately, it didn't solve the computer problem. Now we'll just live with the problem and hope it doesn't get worse before we return to the States in December. But Bill did manage to nab English language guide books for both Slovenia and Croatia in Villach, which felt like a coup. We'll do a little loop west from here to either hike or scout the hiking for next year, then ride through Villach again on our way to Slovenia. We'll be in Slovenia a week to 10 days to do some hiking in the much touted Julian Alps, then its on to Croatia. The heat wave and wildfires in Croatia have us in no hurry to get there. We hope to have our first of 2 installments about the Dolomites on our webpage soon.